Clara Goddard in front of the A.J. Goddard on the shores of Lake Bennett. Image from the Yukon Register of Historic Places. Seattle businessman Albert J. Goddard owned a foundry (Pacific Iron Works) and in 1898 saw an opportunity. People were flocking to the North, drawn by the promise of gold, but once they arrived in the Yukon they needed a way to reach the hotspot of Dawson City. Goddard owned a foundry and had experience in both steam engineering and fabrication. He designed a unique vessel that would not only be able to travel up and down the rivers of the Yukon, but would be easy to transport from the factory to where it was needed. Fabrication began in San Francisco, where the Goddard was made in separate pieces by Risdon Iron Works and shipped to Skagway, Alaska. Rather than taking the coastal steamers that many of the gold rushers were taking, Goddard and his wife Clara decided to take the shorter but much more difficult route over the Coast Mountains. Their gamble paid off, and they and their two vessels arrived safely on the shores of Lake Bennett, British Columbia. Goddard had sent up tools, materials and equipment up prior to the arrival of the two vessels, and over the next few weeks his skilled workers assembled two brand new vessels on the lakeshore under the name Upper Yukon Company. Slowly but surely, the Goddard and her sister F.H. Kilbourne took shape. They weren't alone -thousands of men and women were camped along the shores, anxiously awaiting breakup of the winter ice so that they could make their way up river. The AJ Goddard. Image from the Charles Metcalfe collection of the Alaska State Library. On May 28th, the ice began to move and boats immediately took to the water. The Goddard left her berth on June 2nd and set sail for Dawson City, arriving safely on June 17th. She was the third sternwheeler to make it through the stretch of the Miles Canyon under her own power, and the first sternwheeler to make the trip from Dawson City to the Whitehorse Rapids and back. 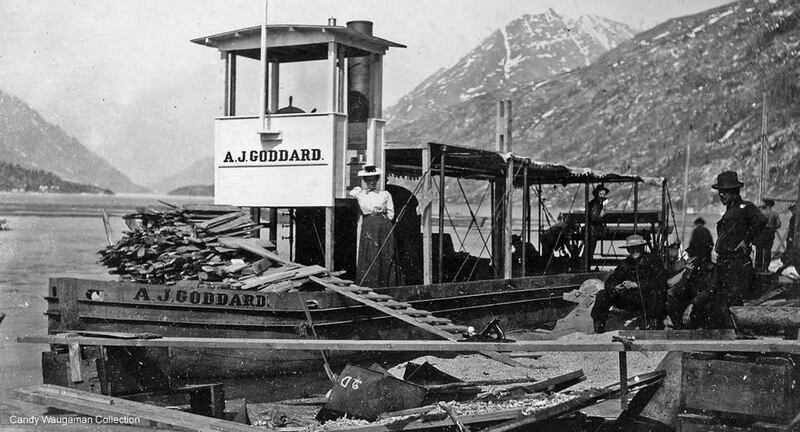 At the end of the gold rush (1899), the Goddard was sold to the Canadian Development Company, and acted as a tow vessel from Whitehorse to the base of the Thirty Mile River. She towed barges and other vessels along the waters of Lake Laberge with a crew of four - Capt. Charles Edward MacDonald, cook Fay Ransom, fireman John Thompson and engineer Julius Stockfeld. On October 11, 1901 the A.J. Goddard, steamed onto Lake Laberge carrying a heavy tow - her captain intended to arrive in Whitehorse before nightfall. Unfortunately, October brings unpredictable weather, and a treacherous storm whipped up on the lake. Freezing rain, snow, high winds and waves battered the small steamboat, ripping her tow from her stern and forcing the Captain and his small crew to struggle to keep her bow into the wind. Despite their best efforts, the waves washed up onto the decks and extinguished the boiler fires. With no power and weather worsening, it was only a matter of time until the A.J. Goddard was swamped and sank just a few hundred metres from shore. She took her Captain, fireman and cook with her. Her engineer and a passenger, C.P. Snyder, held onto the detached pilot house for dear life until, after an hour in the waves, a local trapper rescued them in a rowboat. Years after the sinking, the Goddard was a vague memory. The only hint to her existence was Goddard Point, established in 1936. In 1978, 1986, and 1997 there were three different research and diving expeditions to try and locate the wreck, but all of them came up empty. The bow of the A.J. Goddard peers out of the murky water of Lake Laberge. Image from National Geographic. In June 2008, the Yukon River Steamboat Survey (a collaborative effort including the Government of Yukon, the Institute of Nautical Archaeology, and the Royal Canadian Geographical Society) began an expedition looking for rumoured wrecks along Thirty Mile River. During an unscheduled stop near Goddard Point, a small team decided to lower their gear for a test. Surprisingly, their side scanner picked up a substantial target of interest in 15m of water. The team took numerous scans, confirmed the GPS location, and took note so that they could revisit the wreck. In August 2008, a team returned to the wreck site and the discovery of the A.J. Goddard was confirmed. Her structure sat upright on the bottom of the lake, and her paddlewheel was still firmly attached to her stern. Debris littered her deck and surrounding area - bottles, dishes, wood and metal-working tools, and even some personal effects of her crew. Finally, the Goddard had been found, and practically undamaged. You can see film from the National Geographic dive to the wreck here. New technology has been used to further explore the wreck, creating 3D scans and being able to provide detailed images of the construction of the vessel. There have been a few more dives to the wreck since then, but she isn't the only one in the area. So what makes her so special? Well, the fact that the cold water has all but stopped degradation of the wreck means that she remains a perfect example of this style of ship - one of the only remaining examples, actually. For this reason, she is a wonderful wreck to explore, and to be preserved (the Yukon Government took measures for this in 2010, declaring the wreck an official historic site). 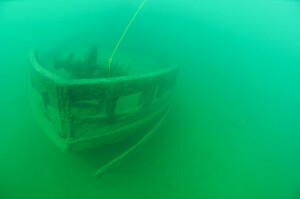 If you're interested in seeing some lovely photos of the wreck, check this out here.